At RefrigiWear, we aren’t here just to keep you warm. We want to make it easier for you to spend long days in tough conditions. That’s why we partnered with Boa® to add their Boa® Fit System to some of our premium boots. The Boa® Fit System gives you a fast, effortless, snug fit all day, all at the turn of a dial. Perfect for cold environments, because you don’t have to remove your gloves if you need to make adjustments. 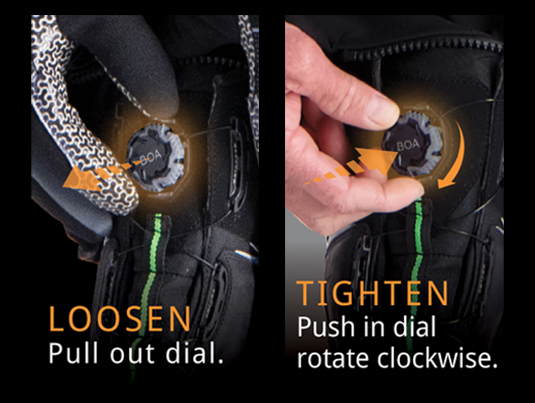 3)	Easily loosen and tighten fit without removing gloves thanks to the dial. Should the Boa system on your boots fail for any reason while the footwear is still in reasonable wearable condition please contact customer service at 866-345-7789 and we will either provide a repair kit or make arrangements to get you back on your feet again.